After the war, Ernest travelled back to Australia via the United States of America with his brother Arthur (1897 – 1974), who had served in the Australian army as a driver. Together they bought a Buick and travelled across North America. 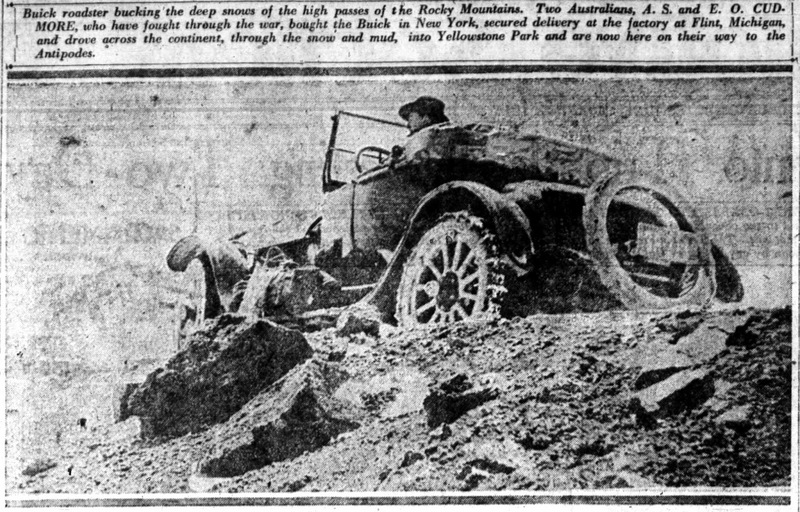 The newspaper article does not mention Ernest’s leg. They arrived back in Australia in September 1919. 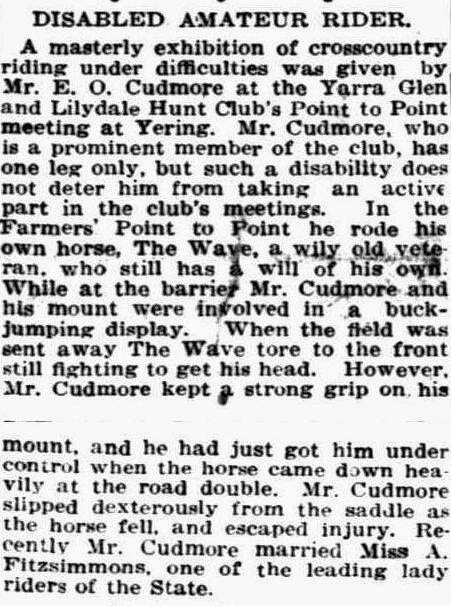 Back in Australia Ernest Cudmore took to riding to hounds. Also riding was his cousin Eileen Fitzsimmons (1896 – 1982). Eileen was Ernest’s first cousin once removed. Her grandmother was the sister of Ernest’s father. Eileen was a successful horsewoman. Her obituary says that she was the most successful horsewoman of her time. Eileen and Ernest married on 23 December 1922 at Christ Church, South Yarra. They lived at Lilydale where Ernest had a farm. Ernest killed himself on 26 September 1924. The inquest found no reason for suicide. Though he had been anxious recently he had no financial troubles or any particular worries. The inventory of assets associated with the administration of his estate showed that the 417 acre farm carried sheep, lambs, pigs, two store cows and a jersey cow and calf (he sold cream). The farm grew crops. There were horses: two hunters, one pony, 6 draught horses and one draught colt. The inventory included a comprehensive description of farm implements and all the household furniture. There was also a Sopwith Dove aircraft, badly smashed, valued at only 20 pounds. His estate was valued at more than eleven thousand pounds. FOR AUSTRALIAN WOMEN. (1922, November 16). Table Talk (Melbourne, Vic. : 1885 – 1939), p. 5. Retrieved from http://nla.gov.au/nla.news-article146457156 mentions the marriage and Eileen’s enthusiasm for following the hounds. 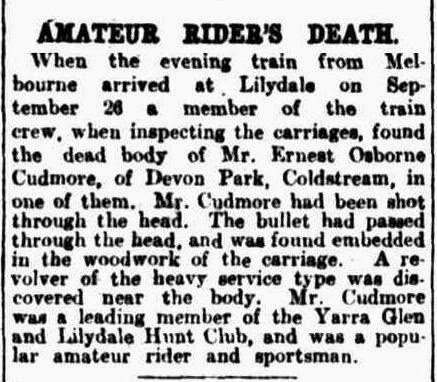 Proceedings of inquest on the body of Ernest Osmond Cudmore dated 8 October 1924, number 1134 retrieved from the Public Records office of Victoria.